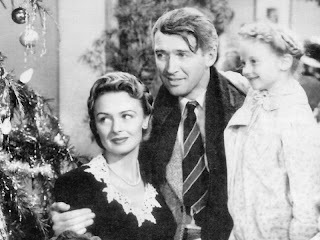 Have you ever noticed how many great Christmas movies came out of the forties? Never have I wanted so badly for a group of characters to find a happy place to celebrate Christmas. It practically turned the end of this movie into a suspense flick for me. Cold-eyed gangster Howard Da Silva demonstrates how to thoroughly terrorize a young couple by simply crushing an ornament. It’s as if he’s threatening to cancel Christmas. Deanna Durbin has a bleak Christmas Eve as she pines for her jail bound husband. A happier Durbin’s intimate phone performance of Silent Night is a peaceful interlude in the midst of a chaotic murder mystery. Robert Montgomery’s Christmas noir, complete with an angelic choir on the soundtrack. Christmas is a troubling season for a struggling couple played by Cary Grant and Irene Dunne in this classic tearjerker. Judy Garland’s moving rendition of Have Yourself a Merry Little Christmas makes such an impact that this mostly non-holiday movie is still satisfying Christmas viewing. Don't forget the Man Who Came to Dinner! Aw, I shouldn't have left it out. The only reason I did was because I couldn't remember what happened; it's been years. I just remembered that it was a big scene and there was something about a bracelet? Well, I plan to watch that one very soon because I've been reading nothing but good things about it around the blogosphere. I hope to have a post about it before Christmas. Another recommendation: "I'll Be Seeing You". Also a movie with a Christmas setting. I'm happy to see Deanna Durbin on your list!! Lady on the Train is one of my favorites of all time. Need to watch it again.